This roast pumpkin dish makes a great accompaniment to slow-roasted meats, such as lamb shoulder. Middle Eastern delis will have shanklish cheese and baharat spice mix. 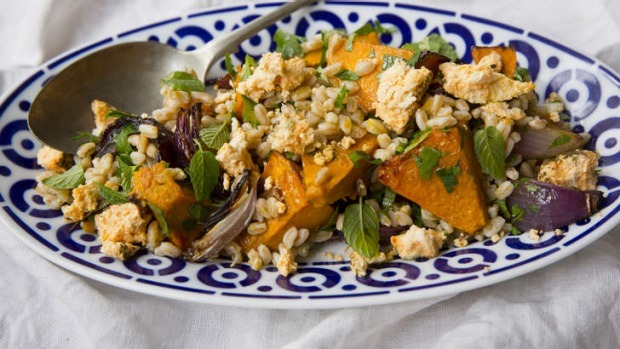 If you can’t find farro, brown rice is an excellent alternative, and goat’s cheese can be substituted for shanklish. Place the farro (or brown rice) in a saucepan. Cover with plenty of water then bring to the boil and simmer for 15-20 minutes or until tender (I don't add salt to the water when cooking grains and pulses as it can toughen them). Drain, then while the farro is warm, stir in sherry and one tablespoon of oil. Set aside. Cut the onions into wedges, trimming the root end but leaving enough intact so the onions won't break apart, and place in a large bowl with the pumpkin. Add a tablespoon of oil and toss to combine. Put the vegetables in a single layer on a baking tray lined with baking paper. Sprinkle with the chilli flakes and season with salt and freshly ground black pepper. Cook for 30-40 minutes until tender. Remove from the oven and cool slightly for five minutes. Place the lemon juice and remaining olive oil in a jar, season with salt and pepper, seal then shake well. Combine the farro, roasted vegetables, green onions and coriander then dress with the lemon dressing, taste and season before serving. Place on a serving plate and crumble shanklish cheese over the top.